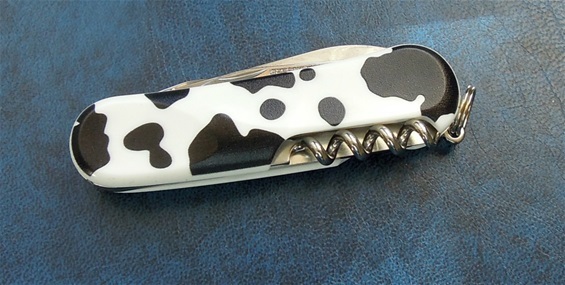 My latest Wenger knife is the EvoCow AF.1.010.009.912.P1. It is in the series with the EvoCheese knife and it is also an Evolution 10 configuration. This is also very nice and it is a piece of art too. 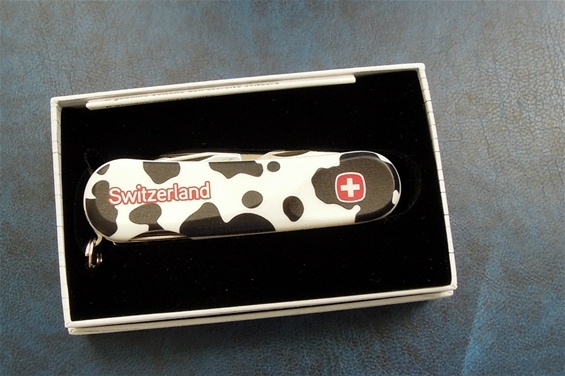 This series of knives represents Switzerland and the products that this country is famous for. Milk products, cheese and chocolate are products from there. It is educational and art at the same time. It is well made and more beautiful in hand than on a picture. For collectors these are interesting because it is limited. Introduced at a late date in the Wenger history and only made for a period of time. I do believe they were made to be a limited product but the change or merging may have interrupted at one point. This we do not know for sure, anyhow it is in my collection. This knife is also into the personalized or interest related theme. There are no negative things to say about any Wenger knives. 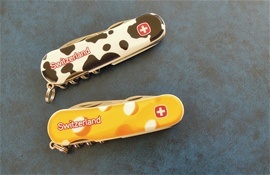 I am very glad for the products they made in the history of Swiss Army Knives. They have been a true giant in the knife world!